Born in 1927 on southern Baffin Island, Kenojuak Ashevak has created some of the most iconic and instantly recognizable images in Canadian Art. She worked in sculpture but she is best known for her entrancing graphic images. These images encompass imaginative and varied themes, with her most favourite subject being birds, especially owls. She began drawing in the late 1950s and up to her death showed a constant interest in experimenting with new techniques. Her imagery remained consistent but she was willing to experiment with various media. She embraced etching and engraving in the 1960s, lithography in the late 1970s, etching and aquatint over the last decade of her life, as well as experimenting with glass, creating a glass sculpture and designing a stained glass window for a chapel. Her enthusiasm and devotion to work has provided inspiration to generations of artists in Cape Dorset. 2004 Created the first stained glass window commission by an Inuit artist at Appleby College, Oakville. 2001 Received a star on the Canadian Walk of Fame,. 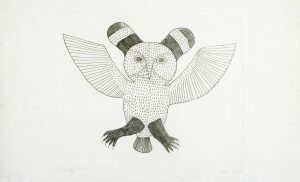 2001 In November, at Waddington’s Inuit Art Auction in Toronto, one of Kenojuak’s prints ‘Enchanted Owl’ sold for $58,650.00, setting a new record for the sale of a Canadian print at auction. 1999 Edition of a 25-cent coin bearing an owl motif by Kenojuak on the occasion of Nunavut’s inauguration as a Canadian territory in 1999. 1995 Received the Aboriginal Achievement Award. 1993 A postage stamp featuring Kenojuak’s drawing for “The Owl” 1969. 1992 Received an Honorary Doctorate awarded by the Law Faculty of the University of Toronto. 1991 Received an Honorary Doctorate from Queen’s University in May. 1982 Appointed a Companion to the Order of Canada . 1981 Mintmark Press. Kenojuak was commissioned to produce a limited edition etching ‘Myself and I’ for inclusion in the book ‘Graphic Masterworks of the Inuit: Kenojuak’. 1980 The 1961 print ‘Return of the Sun’ by Kenojuak was reproduced on a seventeen-cent stamp issued September 25, 1980. 1979 Kenojuak was commissioned to produce a stencil print, ‘Owl with Seagulls’ in commemoration of the Commonwealth Games, in Edmonton, Alberta. 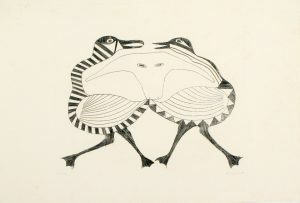 1977 Included in the World Wildlife Fund’s portfolio of six Inuit prints. 1974 Elected a member of the Royal Canadian Academy of Arts. 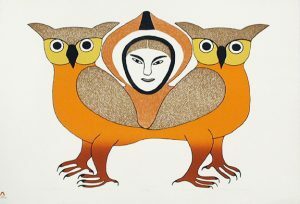 1970 Her 1960 print ‘Enchanted Owl’ was reproduced on a stamp commemorating the centennial of the Northwest Territories. 1967 Appointed to the Order of Canada. 1967 Kenojuak Engraving Portfolio commemorated 1967, Canada’s Centennial Year. 1962 The National Film Board of Canada produced a film about Kenojuak and her life on the land entitled ‘Eskimo Artist – Kenojuak’. Blodgett, Jean. Kenojuak. Kleinburg: The McMichael Canadian Art Collection, 1986. Goetz, Helga. The Inuit Print. Ottawa: National Museum of Man, National Museums of Canada, 1977. Lalonde, Christine, et. al. Uuturautiit: Cape Dorset Celebrates 50 Years of Printmaking. Ottawa, National Gallery of Canada, 2009. Leroux, Odette et al. Inuit Women Artists: Voices from Cape Dorset. Edited by Odette Leroux, Marion E. Jackson, Minnie Aoudla Freeman. Hull: Canadian Museum of Civilization, 1994. National Film Board of Canada. 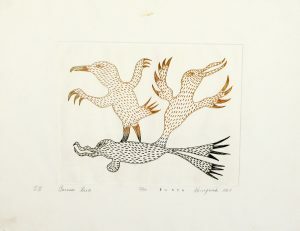 Eskimo Artist – Kenojuak. Produced by National Film Board of Canada with the cooperation of Department of Northern Affairs and National Resources; (c) N.F.B. 1964. Swinton, George. Sculpture of the Inuit. Toronto: McClelland and Stewart, 1999. Vance, Jonathan. A History of Canadian Culture. Don Mills, ON: Oxford University Press, 2009. Walk, Ansgar. Kenojuak: The life story of an Inuit artist. Bielefeld, Germany: Penumbra Press, 1999.